Jjemba Eric Lutaaya is a Teaching Assistant in Dance at Makerere University's Department of Performing Arts and Film. He is in the final stages of writing his dissertation on psychomotor rehabilitation of street children for an MA in Performing Arts at Makerere University; he holds a Bachelor's degree of Arts in Dance (general) and a Diploma in Performing Arts from the same University. He teaches movement awareness and observation, dance fundamentals, adjudication, analysis of African indigenous performance forms. During graduation ceremonies at Makerere, he choreographs the academic procession and punctuates the ceremony with traditional dances and rhythms. He has worked as a dance education facilitator for Makerere University and The Steinhardt School of Education-New York University since 2007. He also facilitates in a joint dance academic program between the Norwegian College of Dance and Makerere University's Performing Arts and Film Department. He has also worked as performing arts' consultant with Ndere Troupe, Plan International-Uganda, Uganda Heritage Roots and Reconcile humanitarian organization in Yei River Country, Southern Sudan. He does part time dance-for- rehabilitation training with Uganda Heritage Roots; a humanitarian organization that uses music, dance and drama to discipline and reform street children. 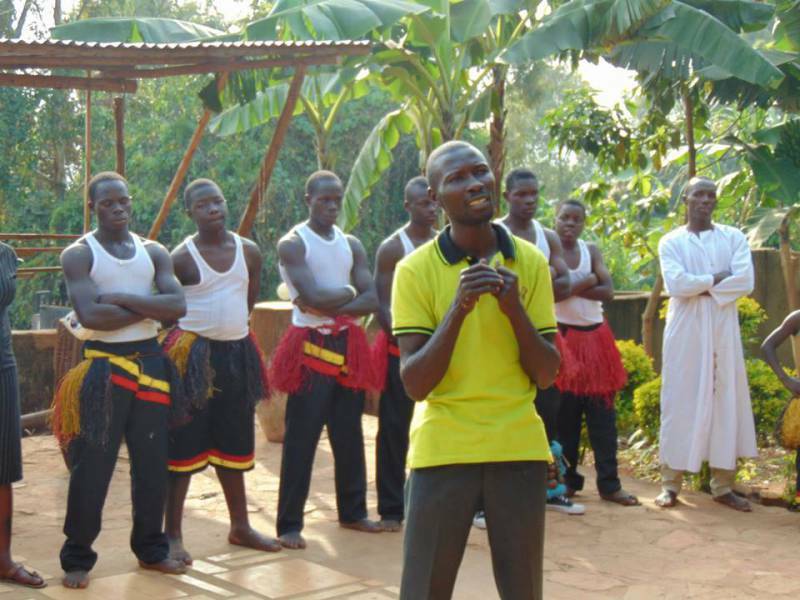 He performs traditional dances/music from all regions of Uganda at his community arts foundation-Naggalabi Indigenous Theatre (NIT) at Naggalabi-Budo. He has performed in both national and international festivals: Uganda Developmental Theatre Association UDTA festival, the Dance Week at the National theatre in Kampala, Festival des Pyrnees at Hororon/ Dijon- France, Festivo Folklorico de Cuidad Real in Jaka-Spain (summer 2003), and the Bagamoyo Arts festival in Tanzania (2005). His has done research on rehabilitation of juveniles, popular culture and its effect on African dance forms. His on going research is about Intangible Cultural Heritage (ICH), which is based on indigenous performances of the Baganda, at Naggalabi Indigenous Theatre (NIT). Eric's interests include creative designing and modeling as an aspect of dance craft and choreography, walking, dancing for fan, soccer, graphics and performance in intangible cultural heritage.